Alicia Zeludlco is the current North Island Riders Rep, and brings years of experience in many facets of dressage; primarily as a rider but also as a DNZ Judge, previous Area Delegate, and current fulltime rider / trainer / and also beginning a sporthorse breeding career. 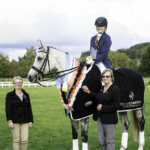 She has been a competing ESNZ dressage rider for the past fifteen years, and has ridden horses for “as long as she can remember”. Young people inspire me, their enthusiasm and ‘live for the moment attitude’ is so refreshing. I have always believed that if you look after the bottom in any sport the elite will pop out the top. Our Young riders are the future of our Sport and we must encourage and support them. There are very few sports were young athletes are expected to compete on equal term with adults; ours is one of them so we must make sure they are well supported and encouraged.